"I joined the Army on Sept. 10th, 2001. After basic training in Fort Leonardwood, Missouri, I was stationed in Bamberg, Germany. 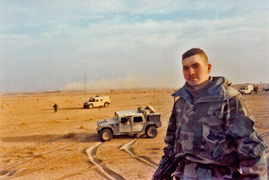 In February 2003 I was deployed to Kuwait and subsequently crossed the border into Iraq on March 19th, 2003. On May 16th, 2003 my vehicle was struck with a rocket-propelled grenade and I was injured. I was still able to render assistance to my driver despite my own injuries and thankfully she is still alive today. 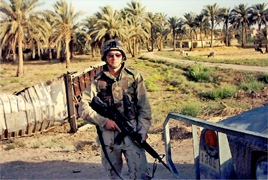 In October of 2005 I was deployed for one more year in support of the Marines fighting in the western desert of Iraq. On the 5th of February 2005 I was honorably discharged from active duty and returned here to my hometown of Cerritos."